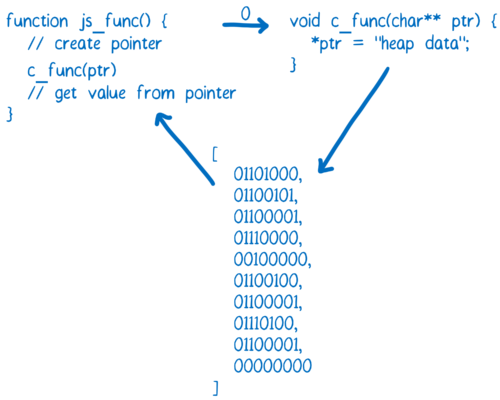 This is the fourth part in a series on WebAssembly and what makes it fast. If you haven’t read the others, we recommend starting from the beginning. In the article about assembly, I talked about how compilers take high-level programming languages and translate them to machine code. Where does WebAssembly fit into this picture? You might think it is just another one of the target assembly languages. That is kind of true, except that each one of those languages (x86, ARM ) corresponds to a particular machine architecture. When you’re delivering code to be executed on the user’s machine across the web, you don’t know what your target architecture the code will be running on. So WebAssembly is a little bit different than other kinds of assembly. It’s a machine language for a conceptual machine, not an actual, physical machine. The browser downloads the WebAssembly. Then, it can make the short hop from WebAssembly to that target machine’s assembly code. 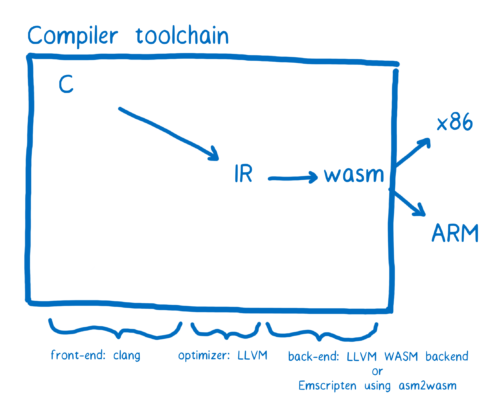 The compiler tool chain that currently has the most support for WebAssembly is called LLVM. 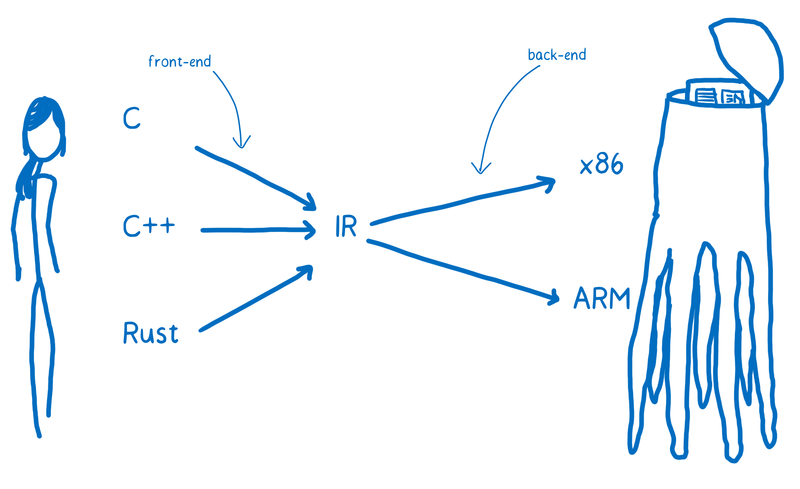 There are a number of different front-ends and back-ends that can be plugged into LLVM. Note: Most WebAssembly module developers will code in languages like C and Rust and then compile to WebAssembly, but there are other ways to create a WebAssembly module. For example, there is an experimental tool that helps you build a WebAssembly module using TypeScript, or you can code in the text representation of WebAssembly directly. Let’s say that we wanted to go from C to WebAssembly. We could use the clang front-end to go from C to the LLVM intermediate representation. Once it’s in LLVM’s IR, LLVM understands it, so LLVM can perform some optimizations. 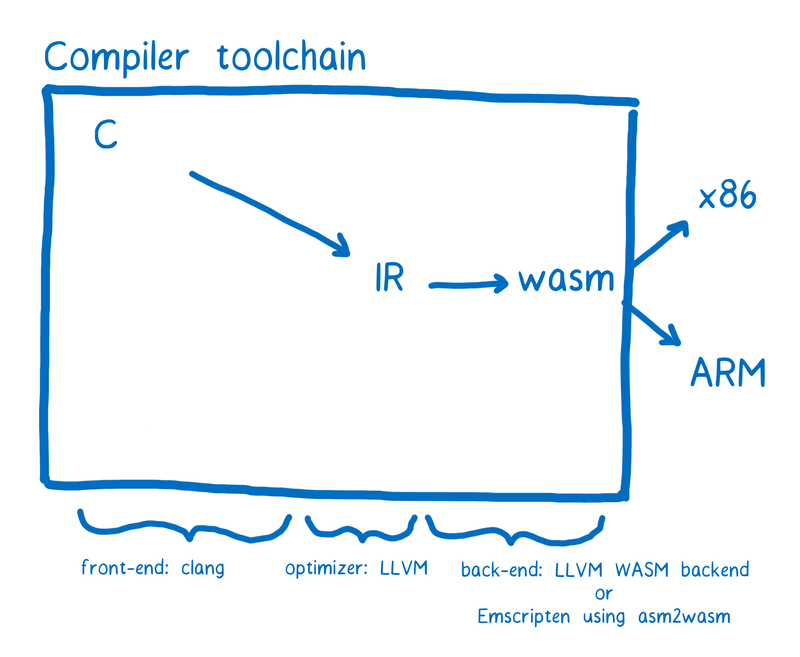 To go from LLVM’s IR (intermediate representation) to WebAssembly, we need a back-end. There is one that’s currently in progress in the LLVM project. That back-end is most of the way there and should be finalized soon. However, it can be tricky to get it working today. There’s another tool called Emscripten which is a bit easier to use at the moment. It has its own back-end that can produce WebAssembly by compiling to another target (called asm.js) and then converting that to WebAssembly. It uses LLVM under the hood, though, so you can switch between the two back-ends from Emscripten. Emscripten includes many additional tools and libraries to allow porting whole C/C++ codebases, so it’s more of a software developer kit (SDK) than a compiler. For example, systems developers are used to having a filesystem that they can read from and write to, so Emscripten can simulate a file system using IndexedDB. Regardless of the toolchain you’ve used, the end result is a file that ends in .wasm. I’ll explain more about the structure of the .wasm file below. First, let’s look at how you can use it in JS. You can see this in more depth in our docs. There is a major difference between WebAssembly modules and JS modules, though. Currently, functions in WebAssembly can only use numbers (integers or floating point numbers) as parameters or return values. For any data types that are more complex, like strings, you have to use the WebAssembly module’s memory. It’s likely that anybody who’s developing a WebAssembly module to be used by web developers is going to create a wrapper around that module. That way, you as a consumer of the module don’t need to know about memory management. If you want to learn more, check out our docs on working with WebAssembly’s memory. If you are writing code in a higher level language and then compiling it to WebAssembly, you don’t need to know how the WebAssembly module is structured. But it can help to understand the basics. If you haven’t already, we suggest reading the article on assembly (part 3 of the series). You can try using the WASM Explorer to compile this function. If you open up the .wasm file (and if your editor supports displaying it), you’ll see something like this. That is the module in its “binary” representation. 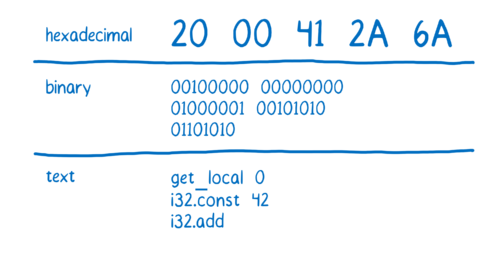 I put quotes around binary because it’s usually displayed in hexadecimal notation, but that can be easily converted to binary notation, or to a human readable format. For example, here’s what num + 42 looks like. In case you’re wondering, here’s what those instructions would do. You might have noticed that the add operation didn’t say where its values should come from. This is because WebAssembly is an example of something called a stack machine. This means that all of the values an operation needs are queued up on the stack before the operation is performed. Operations like add know how many values they need. Since add needs two, it will take two values from the top of the stack. 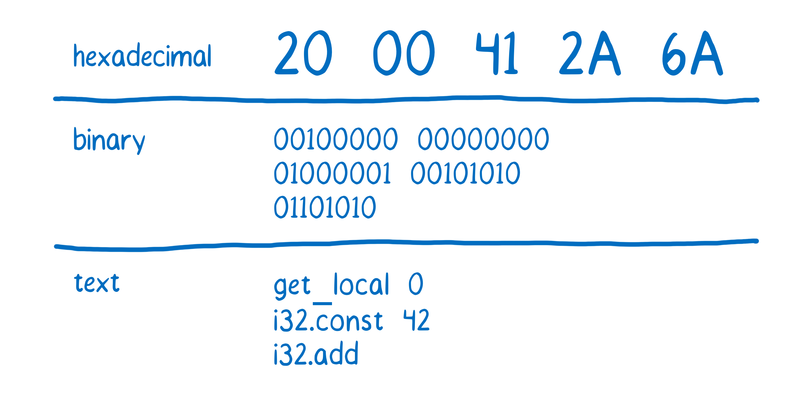 This means that the add instruction can be short (a single byte), because the instruction doesn’t need to specify source or destination registers. This reduces the size of the .wasm file, which means it takes less time to download. Even though WebAssembly is specified in terms of a stack machine, that’s not how it works on the physical machine. When the browser translates WebAssembly to the machine code for the machine the browser is running on, it will use registers. Since the WebAssembly code doesn’t specify registers, it gives the browser more flexibility to use the best register allocation for that machine. Besides the add42 function itself, there are other parts in the .wasm file. These are called sections. Some of the sections are required for any module, and some are optional. Type. Contains the function signatures for functions defined in this module and any imported functions. Function. Gives an index to each function defined in this module. Code. The actual function bodies for each function in this module. Start. A function that will automatically run when the WebAssembly module is loaded (basically like a main function). Global. Declares global variables for the module. Memory. Defines the memory this module will use. Data. Initializes imported or local memory. Element. Initializes an imported or local table. For more on sections, here’s a great in-depth explanation of how these sections work. Now that you know how to work with WebAssembly modules, let’s look at why WebAssembly is fast. Excellent article series Lin. Was waiting for something like since long. 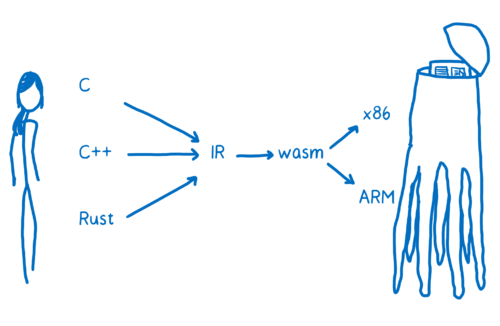 C —> WASM —-> IR —-> Machine Code? 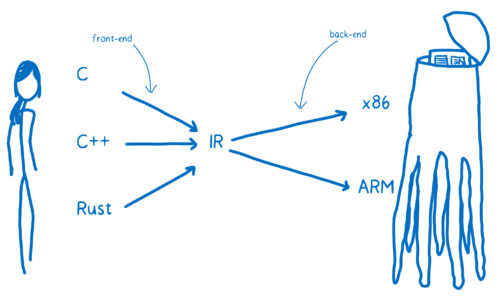 In your second diagram, LLVM’s IR would be sent down to the browser as bitcode. The WebAssembly FAQ explains why they decided not to do this. 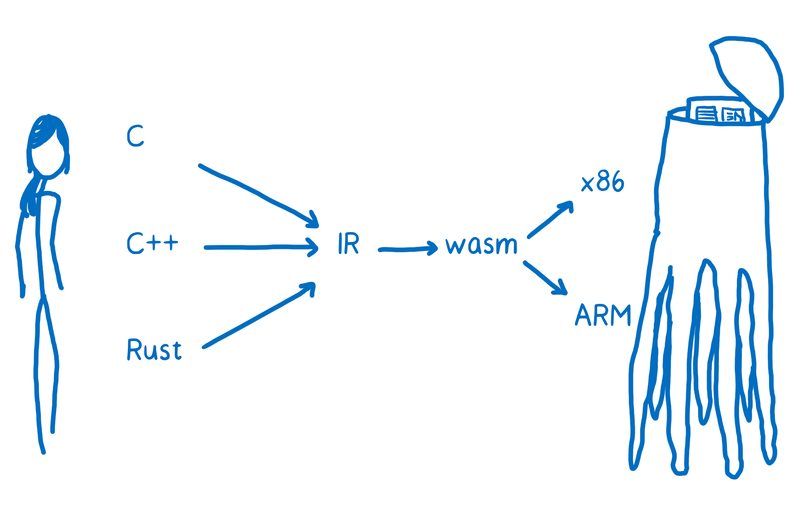 The bridge from C to IR was already there (CLANG), and implementing the bridges from IR to WASM, and from WASM to machine code is both relatively simple. Thanks for the very good explanation about how webassembly works under the hood. I ask myself if it is possible to interact with local hardware like a cardreader from a webassembly module. Could you tell me something about constraints when leaving the sphere of the browser?